Mamass is very proud of her couscous. This is her version. In a large flat bowl, mix couscous with oil, just enough to moisten. Add water and mix well. In a pot, place chicken and sliced onion. Put on medium high flame and add a little oil. Agitate pan to cover chicken and onions with oil. Cook for about 5 minutes. Add salt, pepper and ground ginger. Mix well and cook for 10 minutes. Add enough water to cover. Pour the couscous into a steamer and set on top of the chicken pot. Cover the steamer and cook for 10 minutes. Remove steamer and add turnip and carrot to chicken. Pour out couscous into flat bowl and fluff. Add water and salt, mix by hand. Return couscous to steamer. Put steamer back on chicken pot and cook both for 15 minutes. Remove steamer. Add parsley, tomato paste and chickpeas to chicken pot. Pour couscous into flat bowl and fluff. Add water and mix by hand. Put couscous back into steamer and place steamer on chicken pot for another 10 minutes. Remove couscous from steamer and fluff. Add butter and mix well. 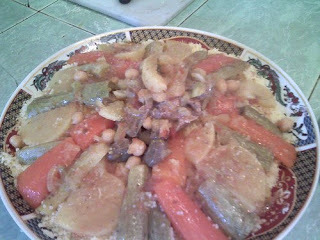 Arrange couscous on flat plate in a low, conical shape. Remove the vegetables and chicken from the cooking pot and put in a separate bowl. Take the vegetables and arrange them on the outer rim of the couscous, pointing them up towards the top of the cone. Place the chicken on top, at the center of the couscous. Ladle the chicken cooking juice on top of the vegetables, chicken and couscous. Serve with squishy flat bread.